Nearly every act of the Sailor Moon manga begins with Usagi introducing herself as “just an average junior high school girl.” We see that she lives in a typical nuclear family with two parents and two children, one boy and one girl. They live in a modest home with one car and she goes to a public junior high school. Aside from her well-established abysmal grades, the Tsukino family is pretty much statistically average, isn’t it? Well, it certainly looks like it, but the facts don’t actually pan out that way when you look beyond the surface. First off, regarding Usagi’s family, Ms. Takeuchi actually modeled the makeup of it after her own, even down to the names of her mother and father (Ikuko and Kenji) and younger brother, Shingo. Though the birth rate has been on the decline since 1973, in 1992 (when Sailor Moon takes place), households with two children still edged out single-child households,1 so at the very least this part of the “average girl” story works out. Now how do things work out with her living situation? 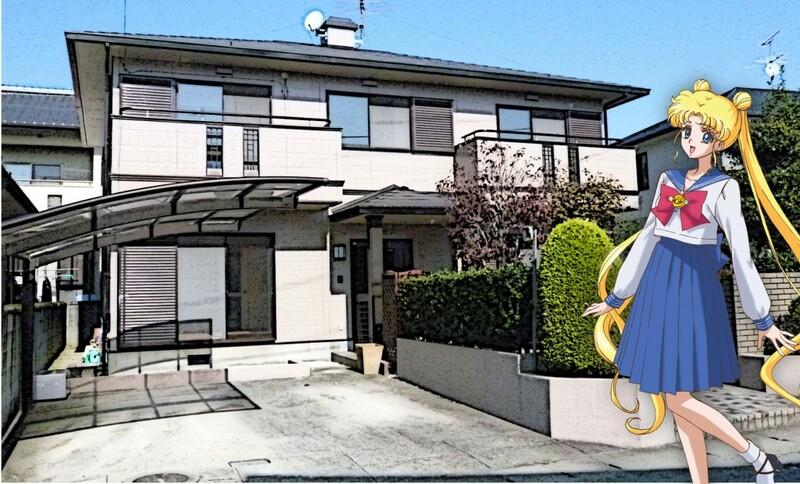 As for Sailor Moon’s setting in Azabu-juban, this is also based on Ms. Takeuchi’s personal experience, though she came to live here as an adult while Sailor Moon was being serialized in Nakayoshi. In reality, Naoko Takeuchi grew up in Kofu, the capital of Yamanashi prefecture – quite a different atmosphere from the city life in downtown Tokyo, the largest metropolis in the world. Let’s take a look back at that house we were talking about earlier. But first, I have to address one obvious point: since we don’t know when Usagi and her family actually moved into the house and don’t want to make a lot of baseless assumptions, we’re going to assume that the house was purchased in 1992 and will be making all of our estimates using that as our point of reference. I’d also like to apologize in advance, because things are going to get math heavy going forward. Azabu-juban is located in Minato ward in south-central Tokyo, incidentally the third most expensive ward in all of Tokyo, but Azabu-juban is slightly cheaper than the average across the ward.2 As we learned in both the original run of the manga and in the new Sailor Moon Crystal series, Kenji Tsukino is a reporter, which will help us get a handle on how much he actually makes. The good news – for us, at least – is that salaries for reporters actually haven’t changed much at all over the past 14 years. The average salaries, shy of a dip in 2010 and 2012,3 have remained nearly the same between 2000 to 2014.4 Since we unfortunately don’t have any data for what reporters were earning back in 1992, we’ll need to look at average salaries across the board and extrapolate what we can from that. Fortunately – once again, for us, and not so much for the hardworking people – there’s been a lot of variation from year-to-year since 1992, but little variation when viewed in the long term. In fact, 1992 salaries seem to be most closely matched with the depressed salaries in 2012,5 which gives us our working figure for Kenji’s income. For the sake of our analysis, we’ll take the 2012 value and assume that Kenji makes approximately ¥6.95 million per year, including annual bonuses. For the sake of comparison, the average salary in 1992 was ¥4.71 million so the Tsukino’s are at least somewhat well off, though not exactly wealthy. Next up, let’s take a look at the house itself and see what we can find out about it. There’s a lot that we don’t know about the house, but there is quite a bit which we do know: it’s a two-story house with three bedrooms,6 and there’s a bathroom, kitchen, dining room, and living room. In real-estate speak, it’s a 3LDK house. The average floor space for a 3LDK in Minato ward ranges between 80.69m2 and 105.4m2.7 Since the price of houses varies greatly depending on the materials, contractors, and architects used, we will only take a look at the land price for now to get a handle on the economics involved. Going back to Minato ward, two-story 3LDK houses on average have a floor space to land ratio of 154%, and by law the building can only cover up to 80% of the land. Assuming the floor space is equally split between the first and second floors, 154% floor space to land ratio gives us 77% coverage of the land. Don’t you just love it when the math actually works out? So using the numbers we got above for the floor space to land ratio, we can figure out how much land they need for their house. This gives us 52.39m2 on the low end and 68.43m2 on the high end for how much land they’ll need for their home. Now, going back to our original figure of ¥6.8 million per square meter of land in Azabu-juban in 1992, this gives us a total land value of ¥356.25 million to ¥465.32 million, just for the land alone. Now, could Kenji have afforded this, even if he took out a loan (for 51 to 66 times his annual income…)? No. Not by a long shot. But let’s try to run the numbers anyway! Assuming that he borrowed the money when interest rates were at their absolute lowest in 1987 (4.9%) before the Japanese bubble burst and not at 7% in 1992 (or worse, 8.5 in 1990/1991! ), he would be paying a whopping ¥1.89 million per month for the next 30 years,8 which is unfortunately more than he makes in a year. Read also: 5 Often Misreported Sailor Moon "Facts"
Again, none of these numbers are 100% accurate since we’ve had to extrapolate and make a lot of assumptions, but I think it at least gives us a pretty clear image of just how not average of a life Usagi and her family live in Sailor Moon. It makes you wonder if there’s more to the family that they’re just not telling us! ← Guardians? Soldiers? What Are the Sailor Senshi? While I appriciate your math, you have to take one thing into consideration. In Japan most inner city houses including the ‘burbs are for rent only. So it does makes sense when Usagis is talking about ‘owning’ a house in a non-legal way. Furthermore Japan subsidize families with more than one child heavily , even back in 1992. So in my opinion it is quite reasonable to believe that they can live in this house and area. Thanks for the comment! Actually, I’d love to see your information for that if you have any sources! Particularly I’m interested in the idea that most city houses being rentals. In my experience (living in Japan for nearly a decade) and all the real-estate information I can find, there are actually very few houses available for rent. It’s very much the exception rather than the rule. With regard to Japan heavily subsidizing families with children, I’m afraid that’s not the case. It works out to roughly ¥10,000 (~$100) a month per child, but when you consider the food, clothing, and school costs for a child, that definitely wouldn’t be adding anything to the family budget. Have you ever considered the fact that either parent may have received or inherited the land from grand- or greatgrandparents of Usagi’s? And as the house there was old, the parents either totally remodelled it (a la Before After) or built a new house up to current standards instead? Those things are all definitely possible. It’s always a hard to find where to draw the line between “ridiculous” and “possible” when over-analyzing anime. 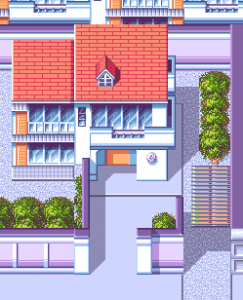 I totally realize that it’s just a cartoon, and that the Naoko wanted to give Usagi a nice house in a nice part of town. But even considering the absurdity of Kenji being able to afford the house, there are always other explanations. 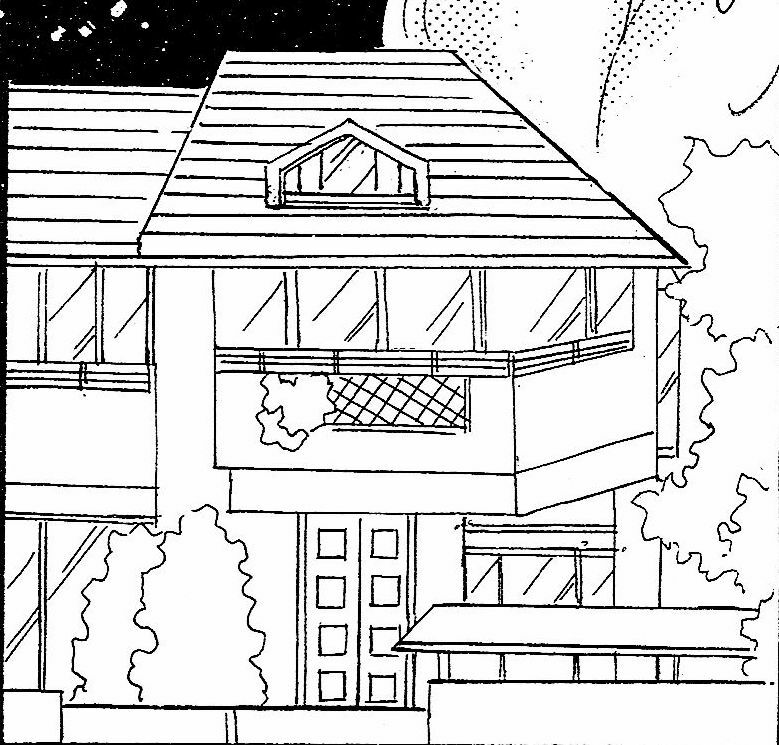 As you mentioned, they could have inherited the land and built the house, either Ikuko or Kenji’s parents could be wealthy and built the house for them (not entirely unheard of), or they could have even won the lottery! Maybe Kenji was just really fiscally responsible and invested all of his winnings, explaining why they otherwise live a pretty normal life. I think you’re forgetting about Shingo. 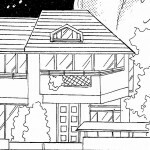 The author can extrapolate that there are at least 3 bedrooms because there would need to be a sleeping space for Usagi’s parents, Shingo, and herself. I may be mistaken as it’s been years since I last saw SuperS, which I hated for that matter, but didn’t Chibiusa talk with Pegasus in some kind of under the roof room? At least it was not Usagi’s regular bedroom.